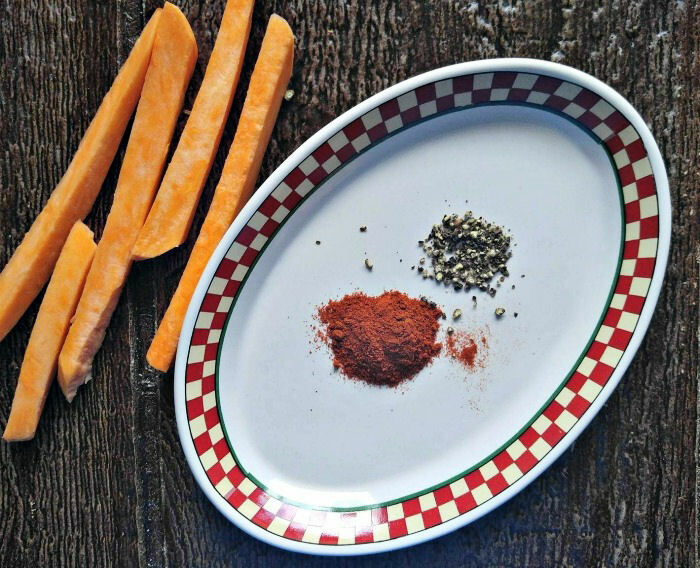 This recipe is more healthy than normal fries, more tasty and very easy to do if you follow a few simple cooking tips. 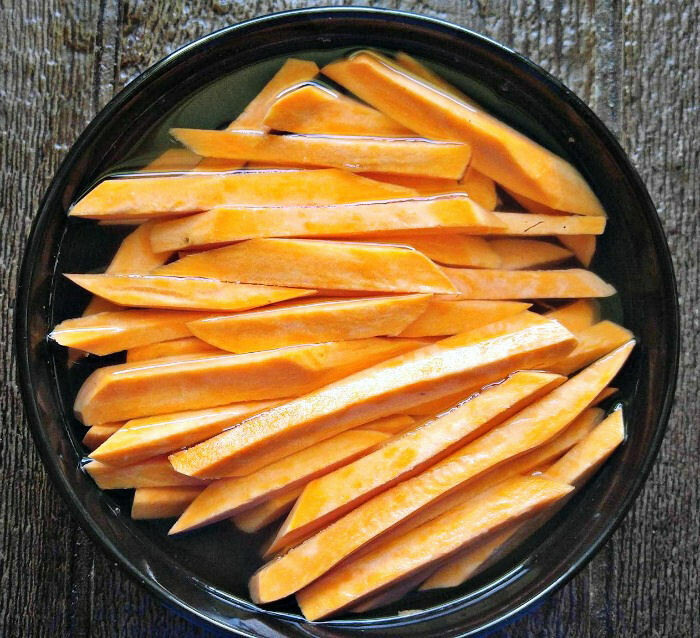 Sweet potatoes pack a nutritional punch. They have less fat and calories than normal potatoes and more fiber. They also have about half the starch of normal potatoes and their glycemic index is lower.. Sweet potatoes can rightly be called a superfood. 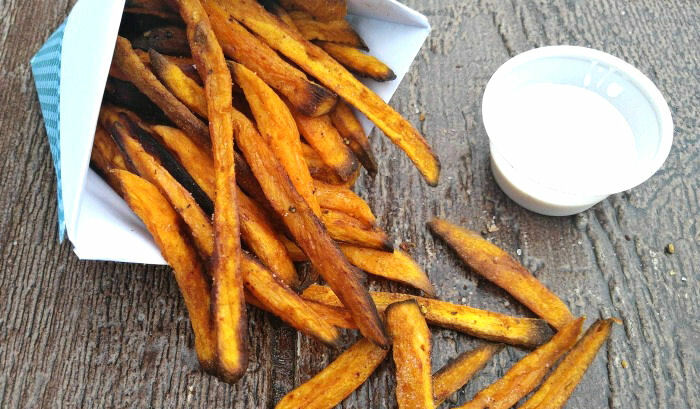 If you have ever baked sweet potatoes, you will know that they end up “softer” than normal white baked potatoes, so making crispy sweet potato fries can be a bit of a challenge. There are a few things that you can do which will help to keep them crispy, not soggy. 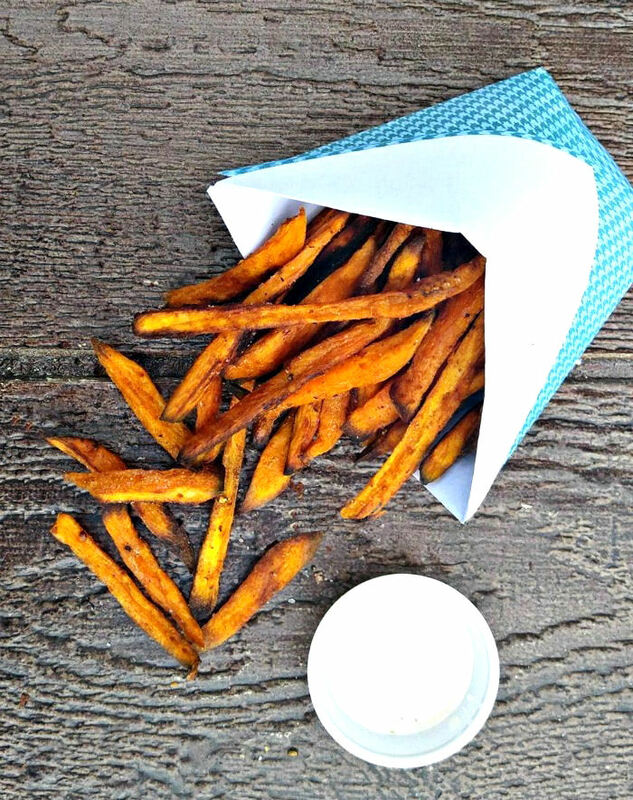 How to make crispy sweet potato fries. 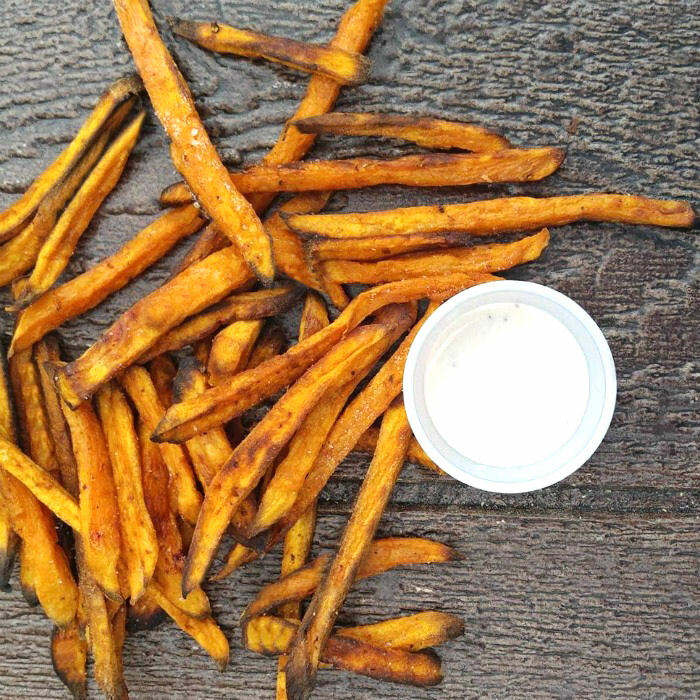 To make the perfect crispy sweet potato fries, every time, follow these easy tips. The size of the fries matters! 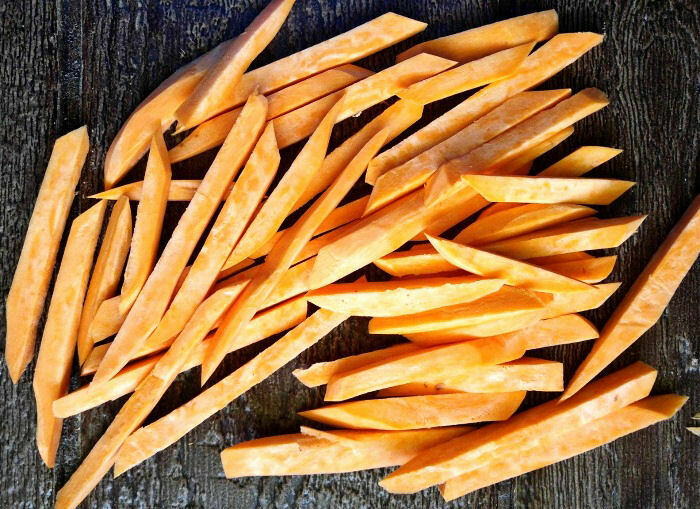 Be sure to cut the sweet potato into smallish fries. I cut mine about 1/4-3/8″ thick. If you try to make them into steak fries, you’ll end up with a slightly cooked outside and soggy center. Soaking the sweet potatoes in cold water for about an hour before cooking them helps to crisp them up. Longer is fine too! You can cut and soak them in the morning and they will be good to go later in the day. Just rinse them in cold water and pat dry on a clean towel before seasoning them. Arrowroot helps to crisp the fries. Now add the olive oil to the bowl and give the fries another shake. Sprinkle over the seasonings and mix well. Now they are ready for the baking sheet. Even spacing means even cooking! Line a baking sheet with a silicone baking mat or parchment paper that has been sprayed with coconut oil spray. 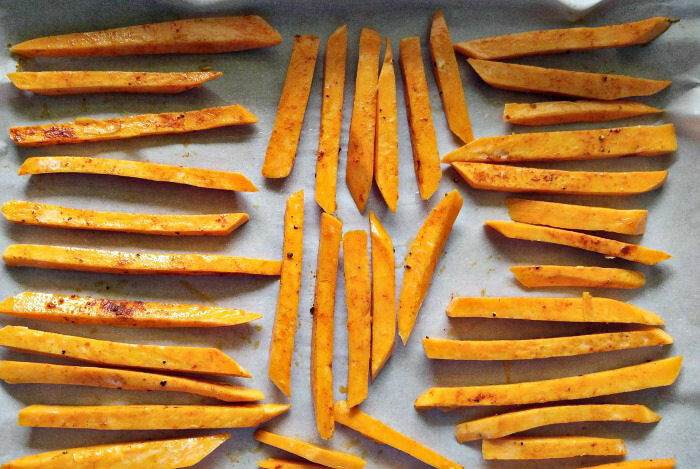 Place the sweet potato fries evenly on the cooking sheet. Be sure not to crowd the fries to ensure even cooking. Even spacing means that the sweet potatoes will let the moisture escape from the fries and evaporate. If you crowd them, there will be too much steam and they will get soggy. If you want to double the recipe and have a lot of them to cook, use two baking sheets. Bake the fries in a preheated 425 º F oven for about 30-40 minutes on the top shelf of the oven. (depends on the size of the fries.) Flip them half way through to ensure that they cook well on both sides. When the cooking time is done, if they are still not quite as crispy as you want, turn off the oven and leave the fries in it for a bit longer to crisp up more without burning. You will notice that my sweet potato seasoning has no salt in it. This is because salt draws moisture out of the fries and creates steam in the oven, resulting in soggy fries. I just add sea salt and garlic salt after they are cooked! Season with the garlic salt and pink sea salt and enjoy! I love to put them in a home made paper cone. These sweet potato fries are the ultimate comfort food indulgence without the guilt of deep frying. You can enjoy them often, guilt free! They are crispy, salty and so, so good for you! Your kids will love them! Serve them with my Whole30 Ranch Dressing for a Whole30 compliant snack. 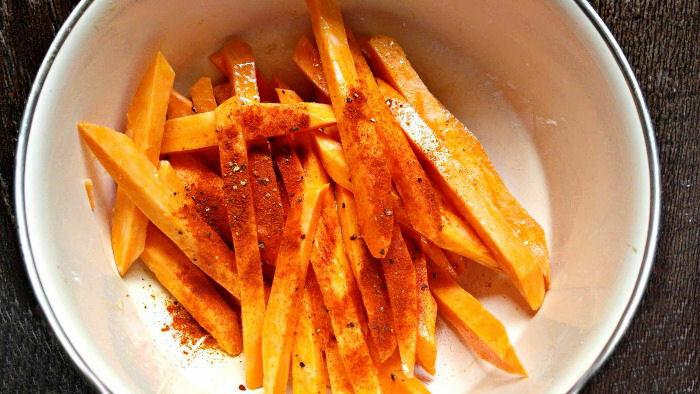 You may think I am nuts but, for me, a sweet potato, cut into the shape of French fries, seasoned and then baked to crispy perfection is the best snack ever. Because they’re baked and not fried I feel good about eating them whenever I get a yen for a snack. I’m all for guilt-free indulgences, aren’t you? Peel the sweet potatoes and cut them into 1/4-3/8" slices. 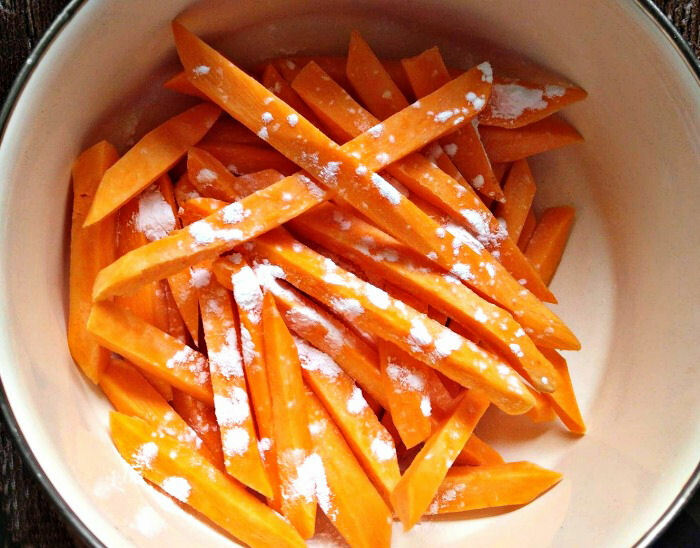 Place in a bowl of cold water for 1 hour (or longer) to help remove some of the starch. 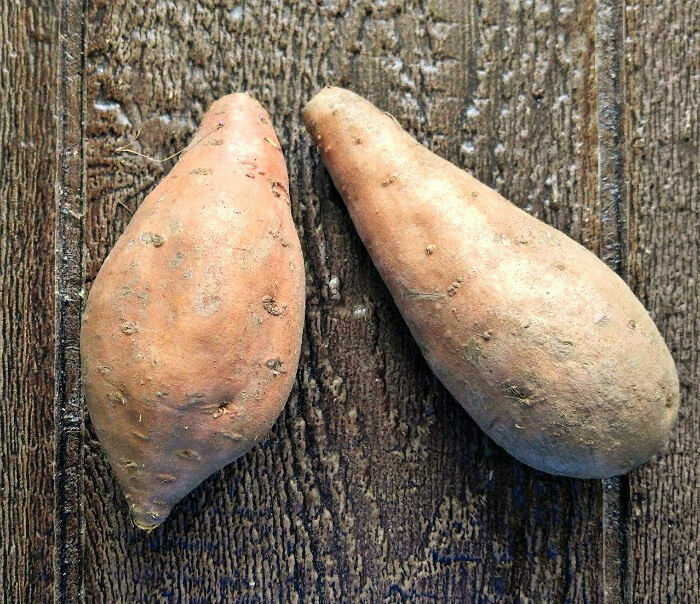 Preheat the oven to 425 º F.
Dry the sweet potatoes with paper towels and place in a large bowl with the olive oil. Mix well to coat. Place the potatoes in a large bowl. Add the arrowroot powder and mix well. Pour in the olive oil, combine well. The final step is to sprinkle with the combined pepper and paprika. Combine well so that they are well coated with the seasonings. Place the sweet potatoes on a silicone baking mat or parchment paper sprayed with coconut oil spray. Cook for 30-40 minutes, depending on the thickness of your fries. Flip them half way during the cooking time. Season with the mixture of sea salt and garlic salt. Enjoy! What dip did you display with your fries?